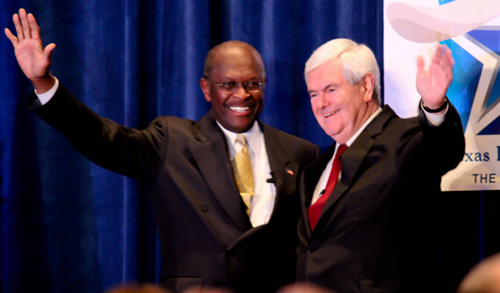 Cain And Gingrich Debate/Who's Not Serious? I attended the Herman Cain/Newt Gingrich debate Saturday night as a TexasGOPVote Blogger. I happen to see Cain and Gingrich as the best options for a Republican nominee, even before the debate, and for different reasons. There have been some questions on the part of some conservatives about some of Gingrich’s actions. But he has admitted to mistakes, as he did at the post-debate Blogger exchange. I could say more and would if asked, but that’s not the point, here. And things have been reported that most Americans might have trouble identifying with, but are not at all extraordinary for people who have attained the necessary means that Newt has. However, no one comes close to his knowledge of history and political possibility; it’s not even close. And Cain is an experienced business administrator and executive, who understands how wealth is created and what interferes with that. I don’t have a lot to say about the debate, because they didn’t much disagree with each other on the discussion topic of entitlements, and I didn’t disagree either. Management of such things needs to be as close to home as possible, and the federal government is the WORST place, and it shows. The Blog as a whole thought it pointless to inquire about the vague charges against Herman Cain, and we individually agreed and had no such interest. But, I watched the Sunday news programs, and was disgusted with the behavior of the conductors of once relevant programs, whose relevance has been waning for some time. And, I had a strong feeling that we are near the point of foolish irrelevance. So much of their comment was silly. And, I don’t mean to question their intelligence. But, they live in such a constricted culture, that they actually think the reflexes of them and fellow members of the professional political class, are serious and important. They aren’t. They believe they know what is significant and need to enlighten the rest of us. They don’t. For example, many played clips of Herman Cain telling media inquirers after Saturday’s debate, that they could review the statements of the harassment allegations that were out there from all involved, but he was through discussing it and was going to get back on message. They played up their perception that Cain was angry and uncooperative. But, he just expressed that he was through with the foolishness. He should be. Many expressed that Cain should just speak up and “get it all out.” Get what out? Cain has denied that he sexually harassed anyone. And the one accuser who received the “settlement” (a severance package to go away and shut up so the Restaurant Association wouldn’t have to pay for a legal contest), didn’t want to speak even after the National Restaurant Association offered to waive the confidentiality element of the agreement. So what’s to get out? Her lawyer asserted that it was a legitimate claim and a legal settlement. Can you imagine that a lawyer would inflate a claim like that? If you can’t, there is a suitcase-full of lawyer jokes waiting for your attention. Sexual harassment charges have become a goldmine for accusers and unscrupulous lawyers. And the Association confirmed that, as he said, Cain was neither part of nor privy to the agreement with the woman. In discussing Cain, there was more than one mention of his foreign policy gaffes or mistakes. First, after Israeli Prime Minister Binjamin Netanyahu had agreed to acquire one captive Israeli citizen by releasing hundreds of possible terrorists, Cain was asked whether he could see himself considering such a deal, and had said he could imagine considering such a deal. Whether he wasn’t considering America’s policy to never negotiate with terrorists, or he hesitated to undermine Netanyahu, the suggestion that that means that Cain under counsel of his advisors might quickly trade hundreds to terrorists for the release of one, is just silly. Executives don’t know every detail that their organization engages. They defer over the counsel of individuals of different specialties. But these people acted as though this was a serious concern. And a few of them discussed Cain’s apparent unawareness that China had had nuclear weapons since the 1960s. Cain’s exact statement was that China was “considering developing their nuclear capacities.” How can you develop your nuclear capacities if you don’t have any? And Cain was discussing the arming of warships to deliver nuclear weapons. Herman Cain is a serious man who worked well over 40 years with American businesses, ran for the Senate from Georgia, and is now running for President of The United States, and will be 66 years old, next month. Can you seriously believe that he was recently unaware that China had nuclear weapons? I don’t find that the tiniest bit credible. I’m 54, and I knew that China had nuclear weapons before I was 12. But I think these people were serious. That’s how removed from reality they are. A whole lot of these experts dismissed the possibility of a Herman Cain nomination, finally grasping at the first single poll that suggested any decline in his popularity among Republicans from 66 to 57 percent, who said they had a favorable opinion of Cain. Bill Krystol on FOX News said, “…but he’s not going to be the nominee, let’s get serious…” Irrespective of my thoughts about Cain, I’d just get a bang out of these people having to eat their words. Perhaps scandalized by the prospect of a nomination of a non-member of their political professionals club, they are repulsed by Cain’s ascendancy. But it isn’t Herman Cain who isn’t serious. Cain & Gingrich: Making Cents? Gingrich is soon to run away with the republican nomination and the then the general election. It is inevitable­, as the guy is unique in his experience­, vision, and ambition to correct the ills of this nation. When you think about past presidents and their desire to leave a lasting legacy and couple that with Newt's historical understanding of such things, you will realize that he is going to be amazing for this country. He will likely go down at a top three president of all time. I am pretty excited. Go to http://www­.nationals­ponsor.com to vote for your favorite candidate.